They say Namibia is a land of contrasts and it’s true. For one of the world’s youngest democracies (it achieved independence in 1990), it constantly breaks other world records for the ‘oldest that’, ‘biggest this’ or ‘smallest that’. For example, it is home to 40% of Africa’s free-roaming cheetah population and between 100 000 and 210 000 Cape fur seals reside at Cape Cross but fewer than 2.4 million people live in an area double the size of California! The Milky Way is clearly visible. Known as the ‘Land God Made in Anger’, more than a thousand shipwrecks are scattered on the Skeleton Coast, the dunes of the 55-million-year-old Namib Desert are moved about by dense fog, and more than 2 500 ancient rock paintings and carvings are found in one area alone. Namibia has a timelessness and a stillness that is found in few other places, and it is a wonderful place to have a true adventure. It was the first country to include an environmental protection clause in its Constitution, and nearly half the land is under official protection of some sort. One of the largest reserves in the world, Etosha means ‘Great White Place’ named after the colossal salt pan in its centre. At least 114 mammal and 340 bird species are found here, along with four of the Big 5 (Etosha’s environment does not support buffalo). The floodlit Okaukuejo waterhole is world-famous for exceptional numbers of animals coming down to drink. A classic Etosha waterhole scene. Considered the oldest on Earth, the desert is one of only two places on the planet where desert-adapted elephants still roam (they have smaller bodies, longer legs and bigger feet than their non-desert cousins). Meaning ‘Vast Place’ in the Nama/Damara language, it stretches more than 2 000 kilometres / 1 200 miles from the South African to the Angolan borders. Look out for herds of wild horses and crashes of desert-adapted black rhino if you go off the beaten track. The sand here is red thanks to tiny particles of oxidised iron ore. The intense colours have made Dune 45 the most photographed sand dune in the world and it’s a tradition to climb it at dawn for awe-inspiring views (pro-tip: wear socks instead of shoes). ‘Big Daddy’ is reputedly the tallest dune on Earth, clocking in at 325 metres / 1 065 feet! 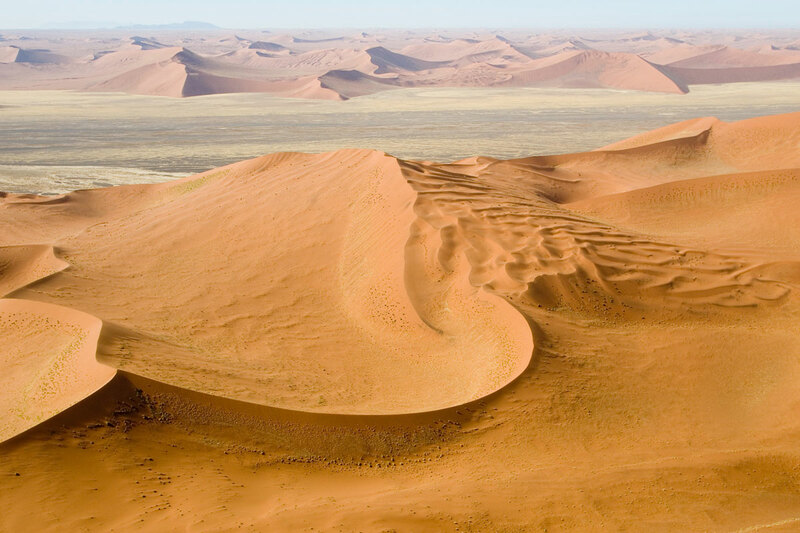 Desert Quiver Camp at Sossusvlei. An otherworldly place that is a photographer’s dream, Deadvlei has the petrified remains of about 50 trees that thrived more than 260 million years ago. Their stark black silhouettes stand out magnificently against the ochre sand. This coastal town is noted for its largely untouched 19 century German colonial architecture, which is something of an anomaly in Africa (about a third of Namibians speak German). ‘Swakop’ is an adventure centre from where you can go skydiving, quad biking, sand boarding and hiking in the Namib. The nearby town of Walvis (Whale) Bay is the starting point for marine safaris to see whales and dolphins in the Atlantic, and about 90% of South Africa’s flamingos literally flock here every year to see out the winter. Translating as ‘I Doubt It Fountain’ in the Afrikaans language, this is the centre of ancient San Bushman art. The paintings and etchings here date back at least 6 000 years. Older than the Grand Canyon in the United States, the Fish River Canyon clocks in at an astonishing 500m / 1 640ft deep, 27km / 17mi wide and 161km / 100mi wide! To have a sundowner here, is to know perfect peace. This abandoned mining town near Luderitz dates back to the 19 century diamond rush. Some prospectors struck it lucky and some impressive houses were erected but by the 1950s, most residents had moved on, leaving the town to be absorbed back into the Namib. Today it is an Instagrammer’s dream as you move through empty rooms and ghostly houses filled with soft sand. 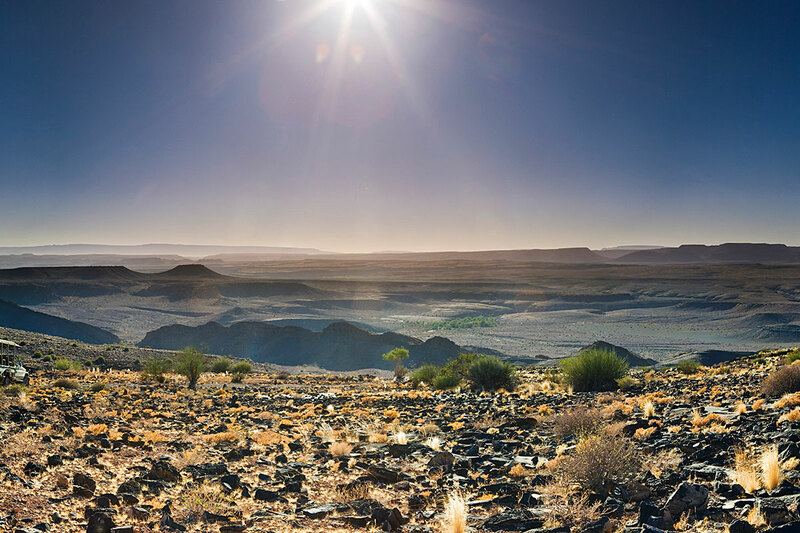 This beautiful valley lies in the remote Kaokoveld and is home to some of the loveliest lodges and camps in Namibia. The Kaokoveld is part coastal desert, part rocky mountains. The Kunene River brings life to this arid region and is a rich blue artery amid the intense oranges and browns of the landscape. 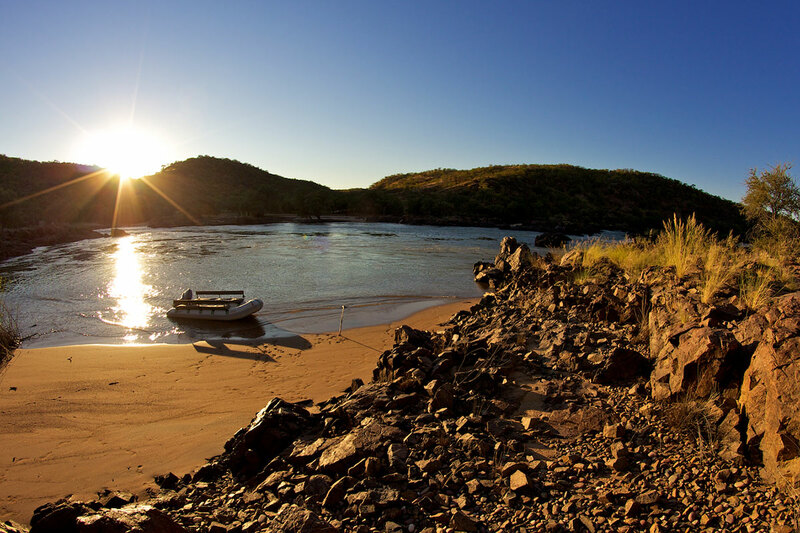 No matter when you travel, sunshine is almost guaranteed – Namibia averages 300 sunny days a year. And by night, the cloudless skies reveal another treasure… one of the three best sites in the world for stargazing, along with Hawaii and Chile, thanks to low light and air pollution. 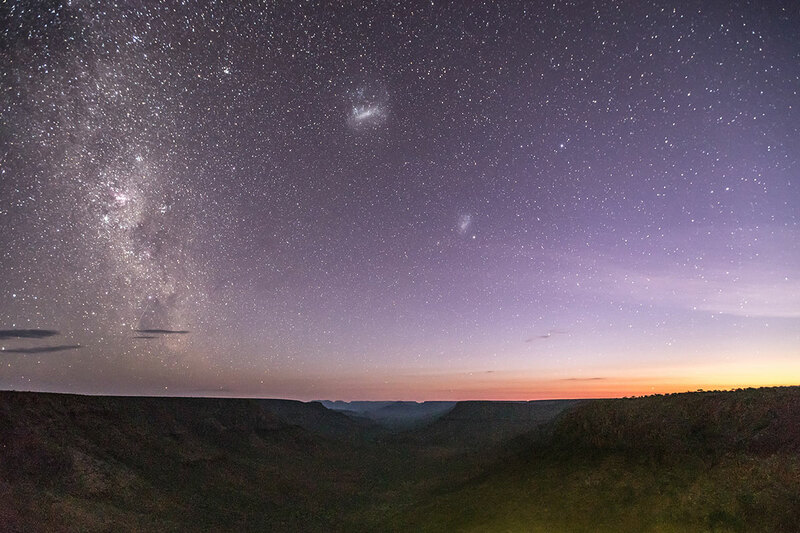 In fact, the NamibRand Nature Reserve is officially one of the darkest places on Earth and has been declared an official Dark Sky Reserve by the International Dark-sky Association. If you’ve always wanted to see the Milky Way as your ancestors saw it, then this is the place in Africa to do so. 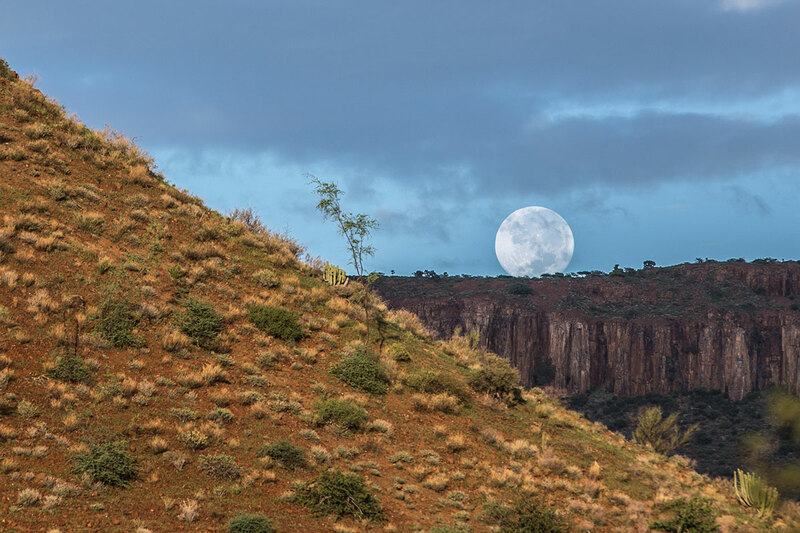 Moonrise at Grootberg Lodge in the Palmwag Concession. 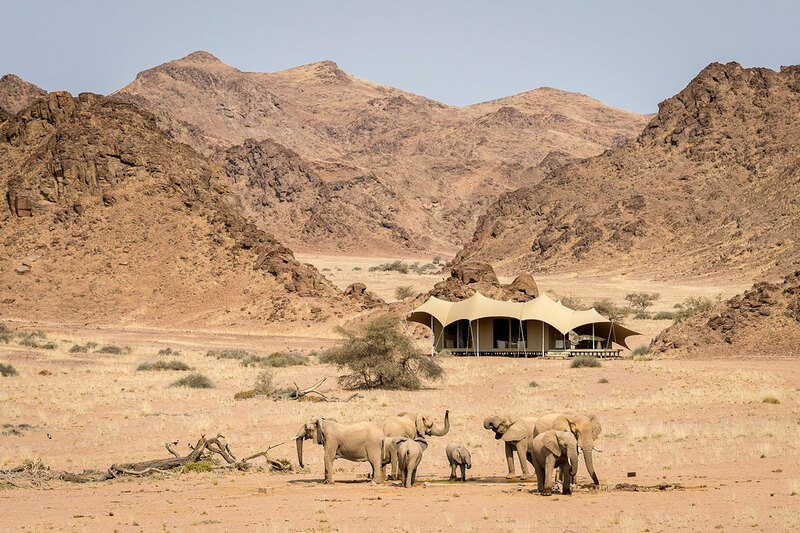 For a quiet country steeped in millions of years of history, Namibia packs a major punch when it comes to things to see and do. Should you Drive or Fly-in? Namibia is a huge country with a low population and plenty to see and do. To visit the country successfully, you need one of two things: plenty of time or sufficient budget. Time will allow you to take the more cost-effective option of driving from place to place, while an adequate budget will allow time-strapped travellers to fly from destination to destination. It’s very tricky to see most of Namibia with little time and little money and, of course, we know that not everyone has unlimited vacation time and a 5-figure budget. That’s why we consult with each client individually, discussing every aspect of their trip, to tailor-make an ideal Namibian itinerary that works for them specifically. En route to Serra Cafema in the Kaokoveld. Namibia is a pleasure to drive in. The infrastructure is generally good and well-maintained, and there are few other drivers on the highways (and certainly no gridlocked traffic jams). If you have more than a week to spend, then it is possible to drive to major sites in the north like Windhoek (the capital), Swakopmund and Etosha. The distances are long, and you must be comfortable driving on the left-hand side of the road, being without mobile phone reception in some areas, and changing a burst spare tyre if necessary. An air-conditioned 4x4 makes the journeys a lot more comfortable. Be aware, however, that will you spend every day driving and not have that much time to simply drink in Namibia’s unique atmosphere. 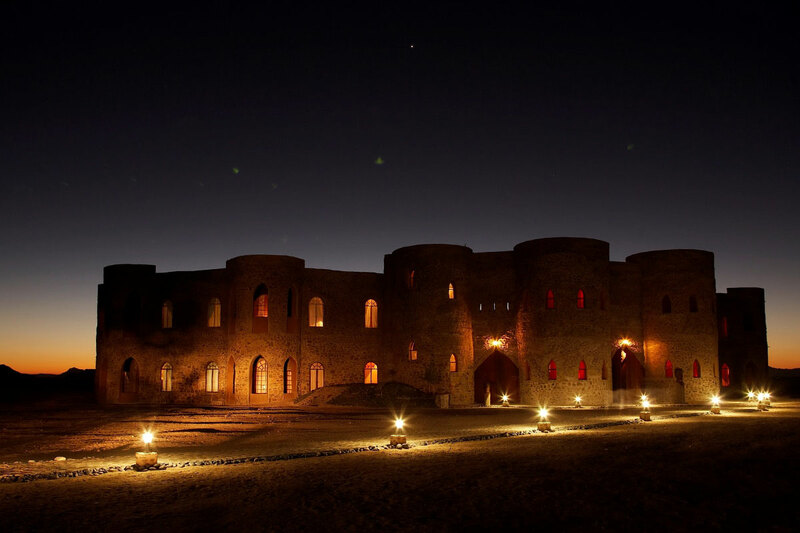 It is far better to set aside at least two weeks to drive through Namibia’s biggest attractions. 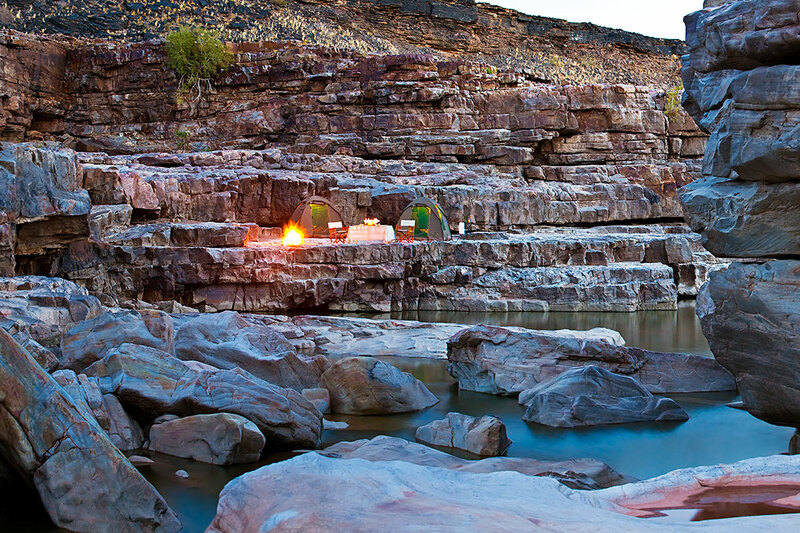 This probably won’t give you enough time to see the Fish River Canyon, which is way down south near the border with South Africa, but it will allow you to spend a few days in each place and not have to drive every day. No-one wants to spend their annual holiday in a car. Driving through the Hoanib Valley. 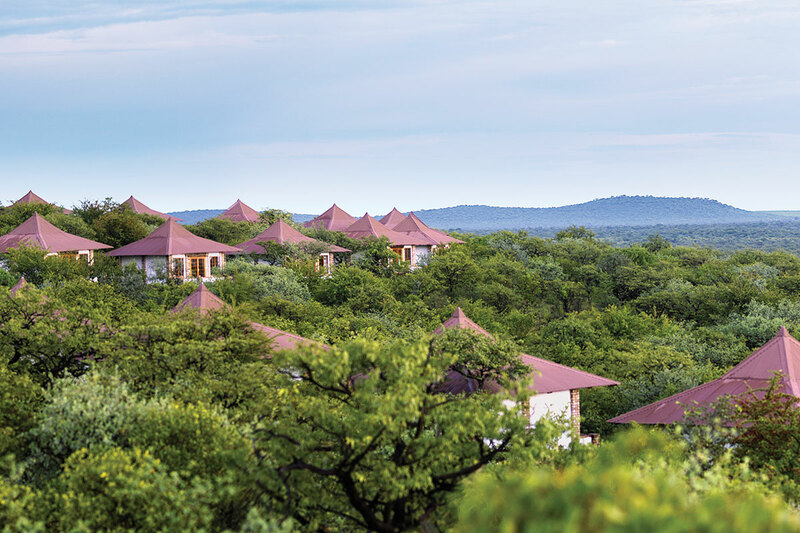 Three weeks will allow you the privilege of taking your time and perhaps even seeing areas like the Skeleton Coast, the Caprivi Strip (which is lush and green thanks to the Okavango, Chobe and Zambezi Rivers) and other out-the-way places like the site of the Gideon meteorite shower, where about 150 meteorites fell to Earth 600 million years ago or the Ombalantu Baobab Tree, which is 800 years old and can fit 35 people in its trunk (which has acted as a church, post office and jail over the years). 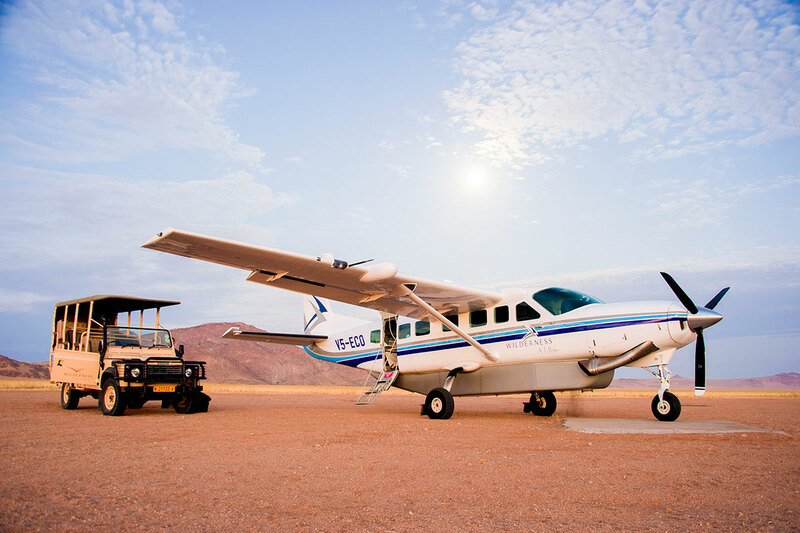 If you want to splurge and see Namibia’s spectacular landscapes from the air, then flying between your accommodations by light aircraft is the way to go. This costs much more than driving but frees up much more of your time: a drive of several hours is radically condensed, giving you more time to enjoy the lodges, go on game drives or see the sights. Flying lets you see the landscape from above. Not all camps have access to airstrips, however, so your itinerary will be influenced by that. Flying is definitely the easiest and most comfortable way to reach remote places like the Skeleton Coast or Kunene, on the Angolan border. 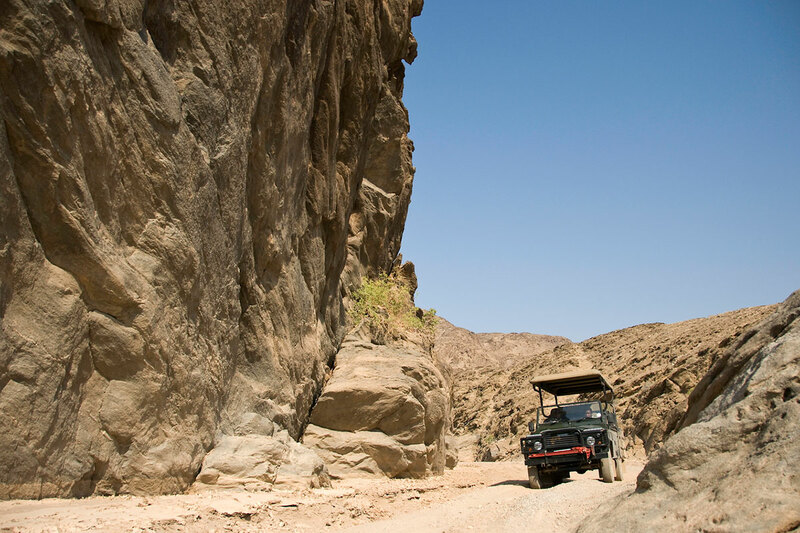 One of our best solutions to combine driving and flying to cut costs, give you some adventure and allow you to maximise your time in Namibia without breaking the bank. So, for example, you may want to drive from Windhoek to Swakopmund and onto Etosha National Park via Damaraland but fly back to Windhoek from Etosha (a more than 7-hour drive) for your onward flight home. Or, if you are really keen on seeing the Fish River Canyon, cut out the more than 8-hour drive there and back from Windhoek by flying. There are lots of options available and your Safari Expert will be able to consult broadly with you on the best one for your time and budget. At Etendeka Mountain Camp in Damaraland. Southern Africa’s seasons are the opposite to the northern hemisphere’s: when it is winter in the United States and Europe, for example, it is summer in Namibia. The general rule of thumb is that the best time for going on safari is during the southern hemisphere’s winter (northern’s summer), when the animals are easier to find because they don’t wander far from the few remaining water sources, and easier to see because the vegetation is thinner and drier. Peak or high season in Namibia runs from about May (autumn) to October (spring) with the winter months of June, July and August being the most popular because they coincide with the region’s school holidays (and, conveniently, with the northern hemisphere’s long summer vacation season). Days are warm and dry while the temperature drops radically during the night, especially around the desert. Namibia is busiest then and places like Etosha, Sossusvlei and Swakopmund will have the most visitors. 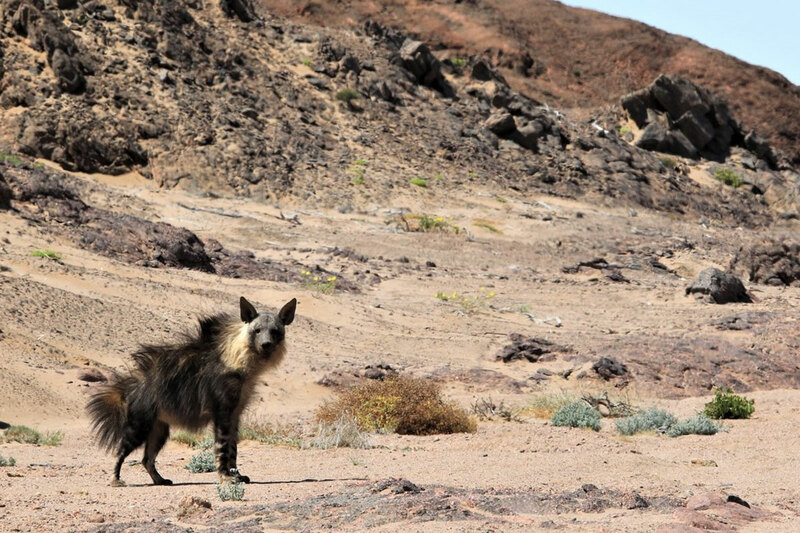 Rare brown hyena in the Hoanib Valley. But don’t picture dense crowds and masses of vehicles: lodges, camps and hotels are small and a limited number of people can be accommodated at any one time. While this makes for a very pleasant peak season, it does also mean that you need to book well in advance should you wish to travel at this time to secure accommodation. Last-minute travellers may find that they simply cannot be accommodated at all. 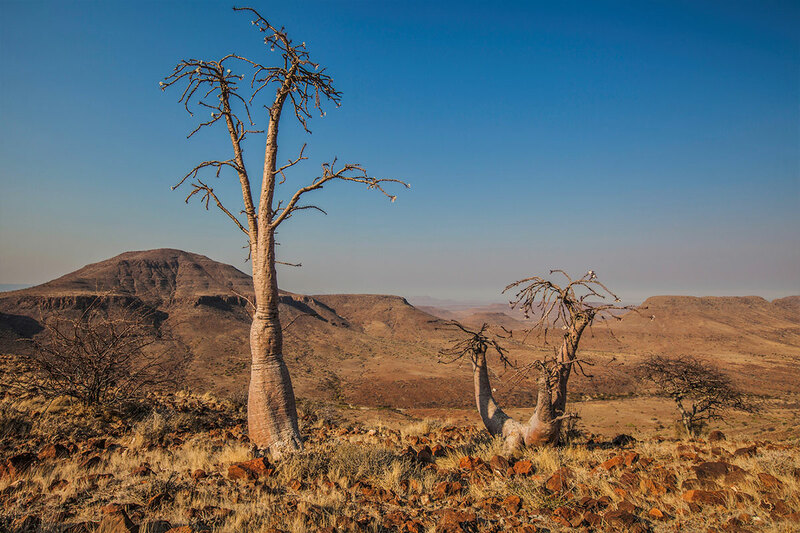 The rest of the year, from about November to April, is the Namibian summer, which has very hot days, balmy nights and occasional rain that makes the arid landscape spring to life with verdant grazing and millions of brightly coloured flowers. It generally only rains on about 65 days of the year. 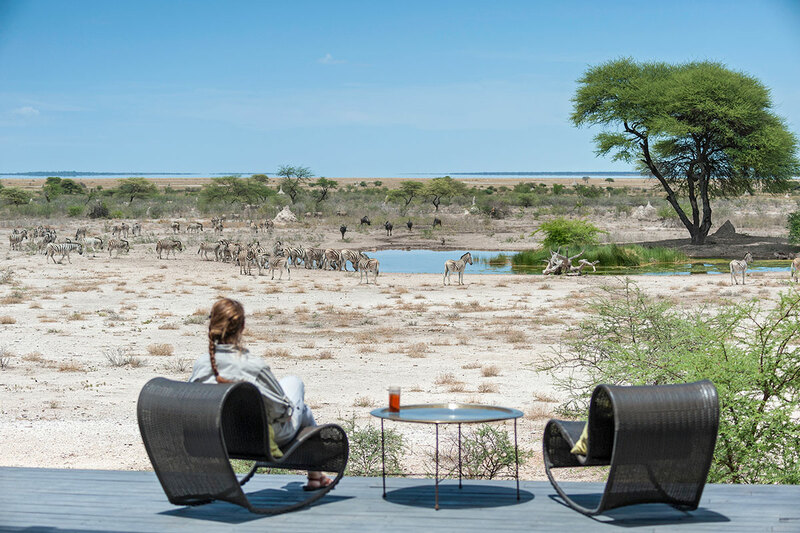 Except from about mid-December to mid-January (Christmas, New Year’s and regional school holidays) and around Easter, low season is one of the quietest times in Namibia when you can pick up good rates and have a wider choice of accommodation. For those who love the sunshine, this is a great time of year to travel as temperatures soar (just be aware that not all accommodation has air conditioning or swimming pools). A mid-afternoon siesta is a must – take a leaf from the animals’ book and rest in the shade during the hottest time of the day. Because of the summer rain, wildlife is harder to find during low or ‘green’ season. There is much more water around so animals roam widely, and the denser vegetation makes them harder to see. But there are also major compensations: the thrill and satisfaction of working hard to find sightings are huge, and there will be far more babies and birds around. All the migrant species fly down from Europe to escape the harsh European winter and many grazers – from antelopes to zebras – drop their young ones now to take advantage of the abundance of food. Giving birth en masse also helps increase their babies’ chances of survival, as predators are overwhelmed by the plethora of prey. It is best to avoid the Caprivi Strip in January and February as it Namibia’s wettest and muggiest place. Driving on the dirt road here may be impossible if heavy rain turns them to mud. Green Season game drive near Mariental. Winter is the most comfortable time to travel from a weather perspective but is pricier; summer is hotter but more affordable. No matter when you choose to travel, start chatting to your Safari Expert as early as possible to get your first choice of the limited accommodation, flights and vehicles. Even though we have been in the safari game since 1998, it’s very hard for us to give a single figure when it comes to costs. There are so many variables to consider, such as time of year you’re travelling, whether you’re flying or driving, whether you prefer comfortable or luxurious accommodation. This is why we don’t believe in a one-package-deal-fits-all approach and prefer to consult with each client individually, using our expertise to tailor-make an itinerary from scratch. All our safaris are all-inclusive, which means that meals, most drinks, park fees and taxes are included in the rate for accommodation and you don’t get any ‘surprises’ when you leave. We also prefer to book and arrange excursions or activities as part of your itinerary for the same reason. As mentioned, flying between destinations is more expensive than driving but also faster and more convenient. Work with your Safari Expert to figure out how much driving you think you can handle if you would like to keep costs down. Driving from Sossusvlei to Damaraland, for example, can take up an entire day of your vacation with stops and breaks. There are enormous distances to cover and even light aircraft flights can last an hour or two. The Namibian dollar has the same foreign exchange rate as the South African rand; in fact, you can pay for items in Namibia with rands although you will receive change in Namibian dollars. Generally, visitors find that eating out in restaurants, taking excursions and sundry expenses like buying gifts are fairly good value for money. Red meat, for example, is well priced. Top-end wines are usually imported from South Africa and can command good but not exorbitant prices. Like most things, the more substantial your budget, the more options you will have. 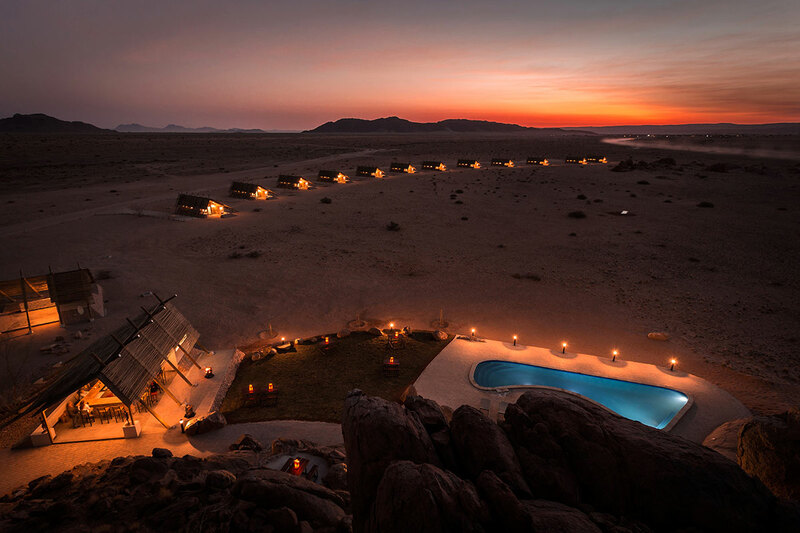 But even those with modest budgets can still find a way of exploring Namibia – the key is to communicate openly with your consultant so that he or she can do their utmost to create the best possible trip for you. Le Mirage Desert Lodge at Sesriem. One of the most exciting things ever is to plan your safari. We can easily spend hours daydreaming about the amazing wildlife sightings we’re going to have, the delicious sundowners we’re going to sip, the amazing people we’re going to meet… But, like all things, dreams are more likely to become real when they’re underpinned by solid plans structured with the help of on-the-ground experts. Old lighthouse along the Skeleton Coast. Namibia is a dream destination but there are plenty of things to consider. Is this your first trip to Africa? 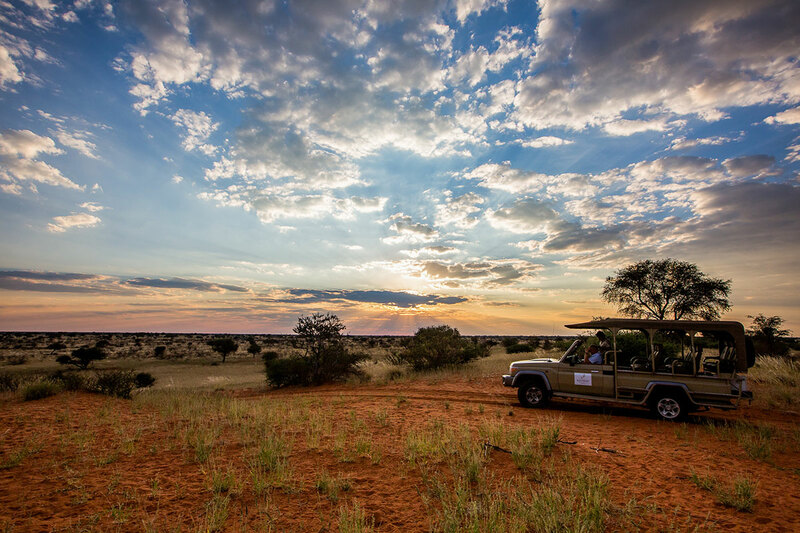 Most of our clients have visited Africa before and ticked off the ‘biggies’ like the Kruger National Park, Cape Town, Victoria Falls, the Serengeti or the Masai Mara before they venture into a more remote destination like Namibia. If you want to drive, have you driven long distances before? Although the scenery can be beautiful, there are very few towns or even garages in Namibia where you can quickly stop to use a restroom or buy a coffee. Sometimes, a tree on the side of the road is all you’ll have, which is part of the fun for our more adventurous travellers. Fly-camping at Fish River Lodge. Do you like driving together as a group? For hours on end, you may not chat to anyone else so it’s best to really get along with your fellow passengers if you’re driving around Namibia. What are your must-sees or must-dos? Unless you have plenty of cash and time, it may not be possible to see and do everything that a varied country like Namibia has to offer. Start with your interests and preferences, and work from there. 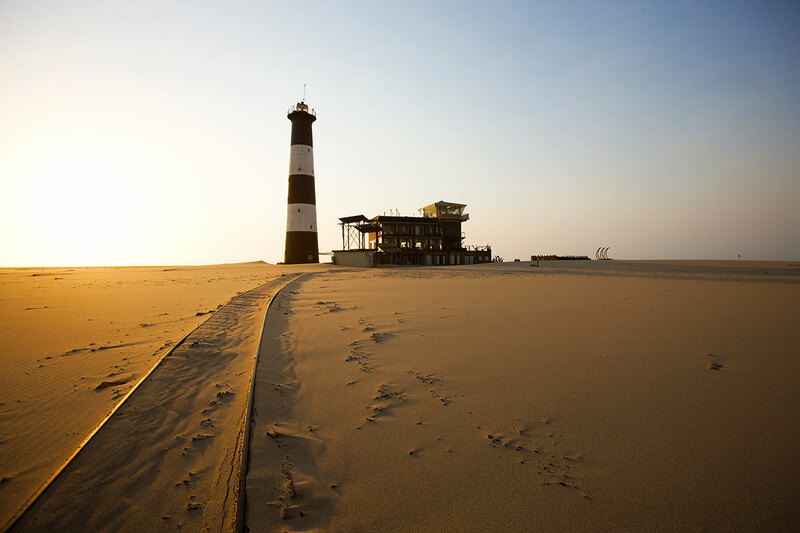 If you prefer history to hiking, then plump for extra days in Swakopmund (where beer is still brewed according to a 1516 German purity law issued in Bavaria) and fewer in Sossusvlei. If you like birding more than beer, then maximise your time in the Caprivi Strip and lose a day or two in Swakop. 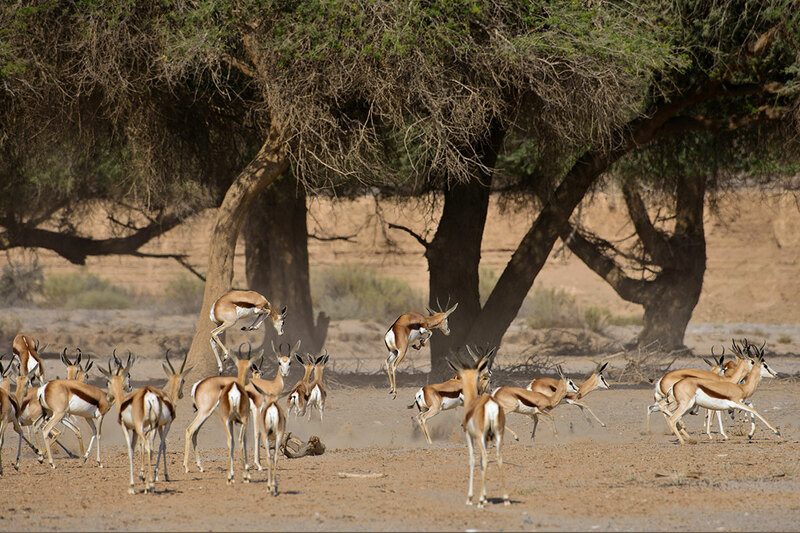 Pronking springbok in the Hoanib Valley. If you want to see Etosha and Damaraland in peak season, then it’s best to start planning a year in advance. This may seem extreme and unnecessary but accommodation is limited and goes fast. If you leave it very late, you may not be able to secure accommodation at all. 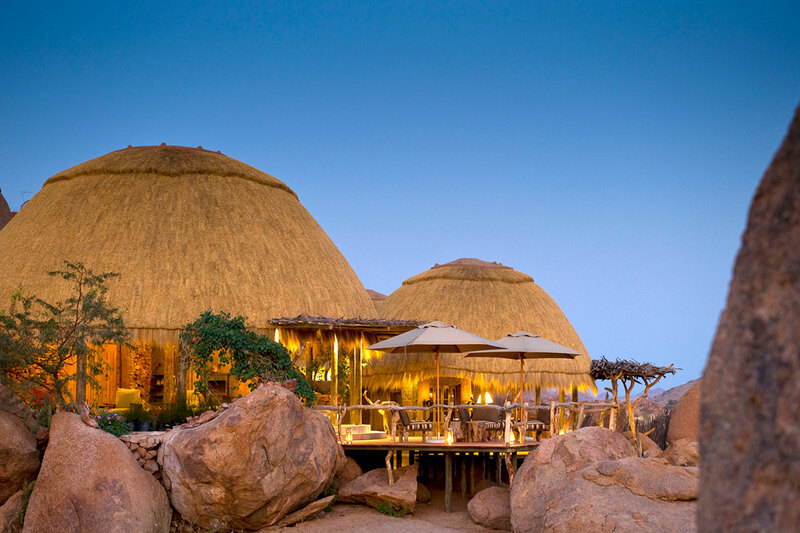 Availability is a key issue in planning a thorough and satisfactory Namibia itinerary. Family rooms can be hard to secure if three or more of you are travelling together – another great reason to plan as soon as you can. If you’re travelling with young children, bear in mind that those under six are often not accommodated on open game-drive vehicles. Some guides may also not stop at predator sightings if there are kids in an open vehicle. There are limited but regular flights from Europe and the Middle East into the capital, Windhoek. If you are coming from elsewhere, like the United States or Australia, you may have to fly into Johannesburg in South Africa and overnight there before making your way to Namibia. Boating at Kunene River Lodge. 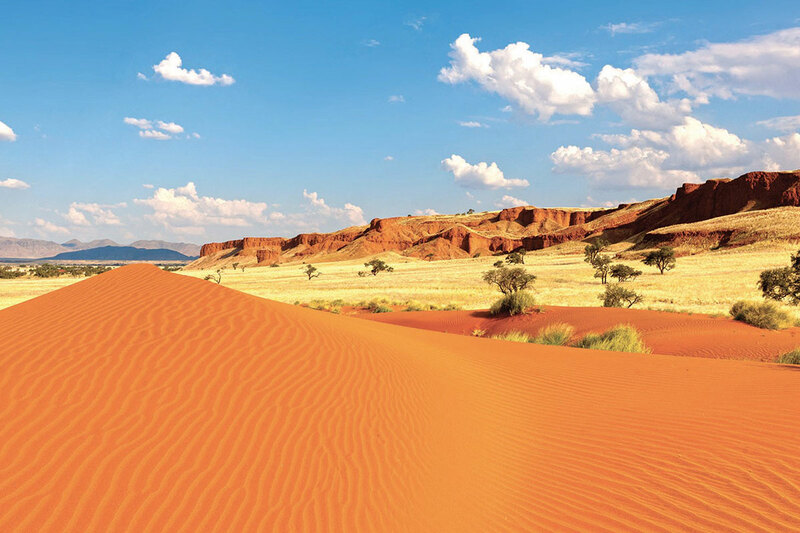 Once you have the practicalities down – when you want to travel, what you want to spend, what you want to see and do, and who you want to go with – you can hand over all of the planning, paperwork and admin to your travel consultant and go back to daydreaming about touching down in Namibia!